Oftentimes, I use the analogy of a sponge. Twisting can be like getting rid of the excess and the unnecessary (like dirty water) and then creating space for new, positive things. What better time than 2015 to make room for exciting, beneficial experiences, both physically and emotionally? Here are some beneficial twists to add to your yoga / stretching routine. 1. From triangle forward bend pose with your right foot forward, rise onto your fingertips and lengthen your spine with an inhalation. Always lengthen your spine on an inhale, as this helps to create space between the vertebrae. Be sure that your back foot (left) is totally on the yoga mat, with your back toes facing up to the front left corner of your yoga mat so that your knee is protected. 2. Place your left hand to the outside edge of your right foot as you exhale. You can already feel the twist start to initiate from the core and side of your waist as you start to turn your belly and heart over and up toward the right. If you have difficulty reaching the floor, use a yoga block under your left hand at any height for support. 3. Inhale once again, and bring your right hand to your low back (sacral spine area); re-engage your core by drawing your belly button to your spine. 4. As you exhale, extend your right arm to the sky…this is your chance to really deepen the twist. Be mindful to keep your hips level. Remember, the upper body (from above the hips) is in the twist, not the lower body! Keep rooting into your back foot, and be sure you’re not locking out your knees. 5. Hold for several deep breaths, all the while energetically extending the crown of your head toward the front of the room. Look up at your right hand only if it is comfy for your neck. Continue to “inhale and lengthen; exhale and twist” deeper. Repeat on the other side after taking a quick break to neutralize your spine between sides. 1. From chair pose, sweep your arms high to the sky on an inhalation. Root your heels into the mat so that the weight is back a bit, and you could lift your toes if you had to. Keep your navel drawing in and up toward your spine. 2. Bring your hands to your heart center, palms pressed together. Lengthen the spine (on the same inhale), and then on an exhalation, start to twist toward the right (keep that deep bend in your knees). Bring the left elbow to the outside of your right thigh, maintaining “prayer” hands. 3. Once again, be sure that you are twisting from your belly and not your hips. Check to see that your knees are aligned to keep your sacrum safe. Continue to press the palms together; this will help your chest remain broad. Your right elbow should point toward the sky. Gaze upward, if comfortable for your neck. 4. Hold for several breaths, and then take a forward fold to release your deep twist and then come to the other side. 1. Sit down with your legs extended straight out in front of you. If you prefer, sit on the very edge of a folded yoga blanket. Bend the right knee and place your foot flat on the floor–right next to the left inner thigh. Keep your chest lifted and core engaged. Relax through the shoulders. 2. Cross the right foot over the left leg, so that your right foot is now outside your left thigh. Stay here with the left leg extended straight onto the mat or bend your bottom knee in. Keep the sit bones grounded to the floor. Place your right hand behind you, tenting your fingers on the yoga mat. 3. On an inhale, extend the left arm high into the air. 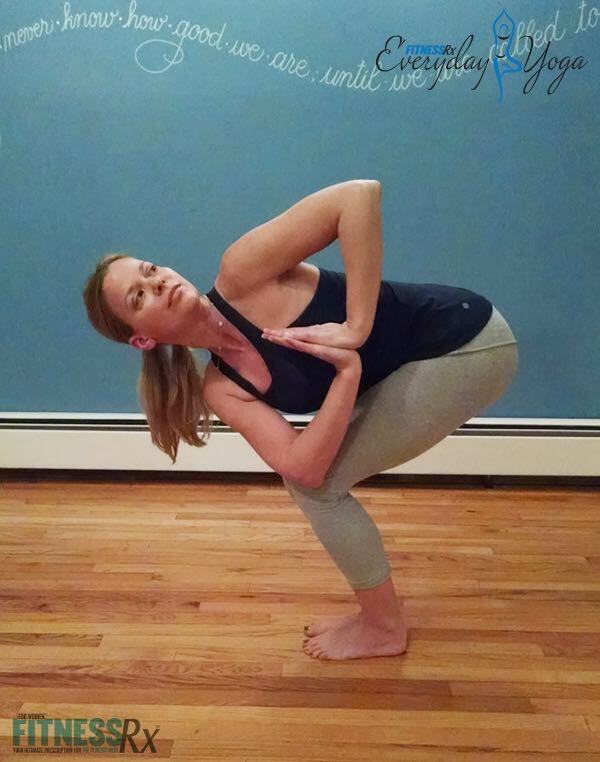 On the exhale, twist–placing your left elbow to the outside of your right thigh. In addition to being an excellent twist, this pose is also a stretch for the outer hips, particularly if you have bent the bottom knee in. 4. With each inhale, lengthen your spine. With each exhale, explore the rotation of the spine and keep turning your belly and your heart toward the right. Keep tension out of your shoulders and face. 5. Perform a counter twist. Keep your legs as is, and simply twist over toward the left, letting your elbows (possibly) touch the floor as you fold. Repeat on the other side. As I mentioned, it is very important to twist from the correct place, your belly and side body—not the hips. You may find that with continued practice, you are able to twist deeper and deeper, going farther not only in these and other twisting poses, but also in back bending postures, as backbends and twists in yoga go hand in hand. Think about whatever it is YOU need to be free of, and choose to try and wring it out during your practice. When you are done, reflect on how you feel. Yoga is a major key toward physical and mental freedom. Namaste!